Lamar Anderson a member of the Parky's boxing group works on the seed bags as part of his training at Rocksteady Boxing inside Aqua Worx in Logan. There is a boxing club in Logan for people 50 years and up. There are no sissies in this group. Twice a-week they enter the gym, don their boxing gloves, and go after it. They call themselves the Parky’s. 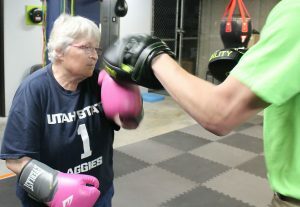 These seniors spend time hitting the heavy bag, speed bag and double-ended bags. They are jumping rope, doing calisthenics and circuit weight training, all in the basement of Aqua Works at 209 W. 300 N. in Logan. Susan Madsen, one of two woman participants in the boxing program, works on focus mitts worn by Jaedon Flake. Madsen has been there from the first workout and is still an active participant in Rocksteady Boxing. Rocksteady Boxing is where people gather to complete a workout, which includes strength training, reaction time, balance workouts, and learning to fall. These folks are serious about what they are doing. With personal trainers at their side, they are battling their fiercest enemy, Parkinson’s disease. 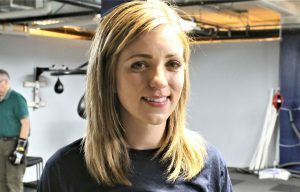 Cassie Webster, a physical therapy assistant who coaches the program, said research from the 1980’s has shown forced exercise, like boxing, increases the fine and gross motor skills, as well as the memory of the participants. Michelle Harmon, the administrator over Aqua Works, said researchers have determined boxing is a deterrent for Parkinson’s. Approximately 60,000 people are diagnosed with Parkinson’s disease every year, according to the Parkinson’s Foundation. The disease is a progressive nervous system disorder affecting movement. Generally, Parkinson’s symptoms start gradually, sometimes with a barely noticeable tremor in just one hand. Besides the tremors, the disorder also commonly causes stiffness or slowing of movement. Although the disease can’t be cured, research has found there are medications and exercises that can significantly improve their symptoms. Cassie Webster, a physical therapy assistant who coaches the program, was certified as a Rock Steady coach. She said the program is making a difference in the lives of the participants. Webster said the group is really good at trash talking each other, as well as group leaders. The certified Rock Steady National instructor said she sees more progress the boxers are making compared to the people that don’t box, and there is a marked difference in how well the boxers are progressing. She said sometimes they have been to physical therapists and are too tired to come. Weather is also a consideration. If it’s snowing, they see fewer participants. Jaedon Flake, an exercise specialist, was working the focus mitts, catching punches from participants and having them duck and weave. He also sees a difference in the progress of the participants. When the boxers are done with the session, most are exhausted after hitting every boxing bag in the place. The bell that hangs on the wall of the basement of Aqua Worxs where the Parky’s work out twice a week. 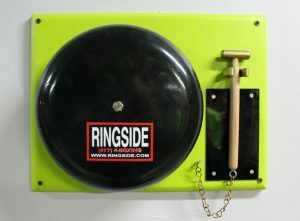 They’re time in the ring program includes exercise, strength training, reaction time and balance. The boxers are also taught how to fall without getting hurt and how to get up after they fall. Susan Madsen, one of two woman participants, has been there from the first workout and is still an active participant.